Chocobo’s Mystery Dungeon Every Buddy! 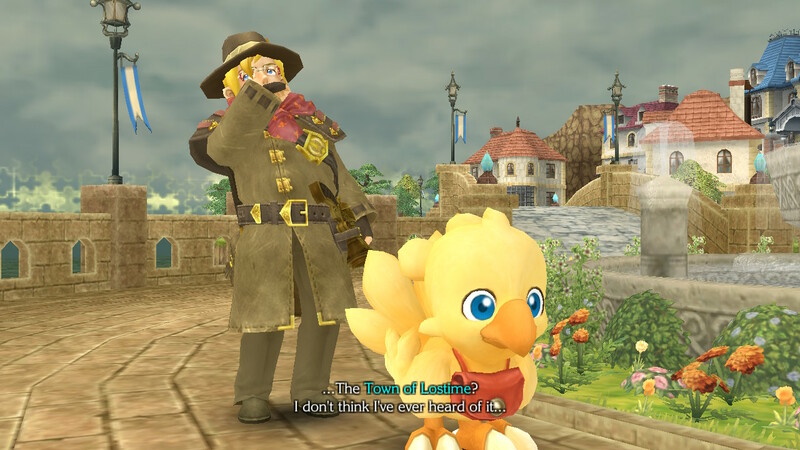 is a remastered port of 2007’s Wii title Final Fantasy Fables: Chocobo’s Dungeon, a game that had a decent critical reception, but failed to sell an ideal amount of copies. Alongside a flashy new title, the game comes with a few additional features, including a buddy system that allows you to befriend enemies and have them assist you in your dungeon crawling journeys. Thankfully I can say that Chocobo’s Mystery Dungeon Every Buddy! was a game worthy of being given a second life, as its addicting roguelike mystery dungeon gameplay, interesting story, vibrant visuals and epic soundtrack making it a joy to play, despite some minor issues with some of the gameplay features. Our story begins with the adorable protagonist Chocobo and his treasure hunter owner Cid making their way to the Tower in the Sands, a monolithic building believed to house an item known as Timeless Power, which Cid wants to use to power his airship. Upon making way through the tower, they find the legendary item, only for it to be in the hands of Cid’s rival treasure hunter Irma who’s accompanied by her Chocobo Volg. Before any confrontation can ensue, a giant portal quickly whisks everyone away. Chocobo and Cid wake up in Lostime, an odd dreamlike town in which the inhabitants have their memories erased every time the town bell rings. As Chocobo, you are tasked with trying to bring back the memories of the townsfolk, all while trying to find out how to stop the Bell of Oblivion and locating Irma and Volg. The narrative of Chocobo’s Mystery Dungeon Every Buddy! isn’t perfect, but it does succeed in being so weird that you can’t help but be engaged. For example, there’s a baby that hatches from an egg and teleports into the minds of the people of Lostime, and he ages at a rapid rate, yet somehow this is seemingly the norm in Lostime, and they don’t seem too bothered by it (maybe they forgot that babies aren’t born from eggs?). In all seriousness though, the story is strange but it does remain interesting throughout, but don’t expect it to blow you away or be anyway near as gripping as mainline Final Fantasy titles. 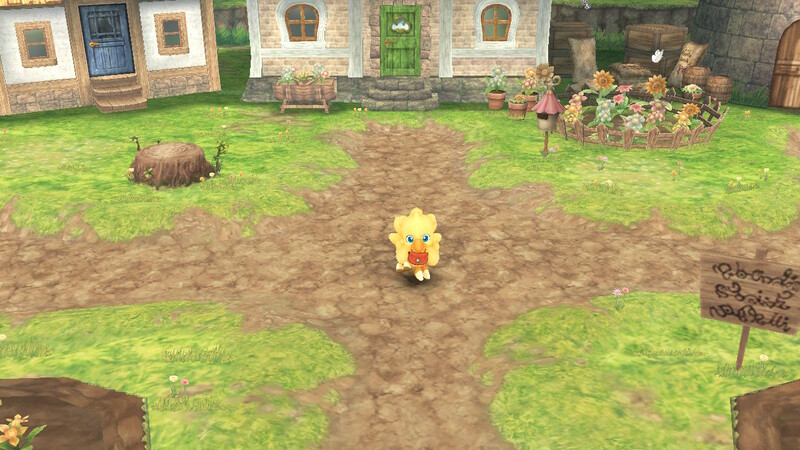 Speaking of mainline Final Fantasy titles, Chocobo’s Mystery Dungeon Every Buddy’s soundtrack is masterfully built using a litany of tunes from games in the series, from songs such as the ever-memorable overworld theme of Final Fantasy IX, to the tune that plays at Chocobo Farm in Final Fantasy VII. Although my Final Fantasy experience is lacking, I found myself feeling a sense of familiarity and nostalgia with these tracks, having come across them before while listening to Final Fantasy soundtracks. What is amazing however, is that these previously made tracks seem to fit the colourful vibrant world of Chocobo’s Mystery Dungeon Every Buddy! perfectly, never feeling out of place in the slightest. Having the soundtrack consist almost entirely of previous Final Fantasy tracks was an excellent little bit of fan service on behalf of Square Enix, leading to a soundtrack that is stacked with brilliant songs that will engage both new players and Final Fantasy diehards alike. The story is intriguing and the soundtrack is brilliant, but it’s the gameplay of Chocobo’s Mystery Dungeon Every Buddy! that is arguably its most alluring asset. 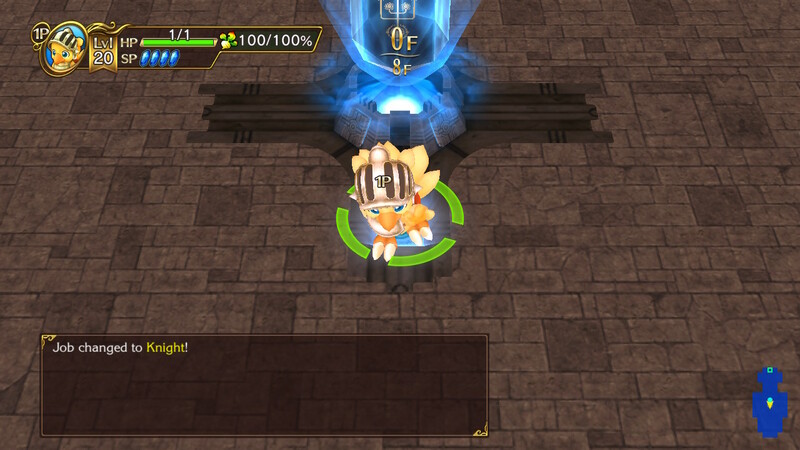 As the title suggests, Chocobo’s Mystery Dungeon Every Buddy!, is a mystery dungeon game. Mystery Dungeons are essentially roguelike games in which players must make their way through randomly generated dungeons, killing enemies along the way while trying to successfully complete every floor. 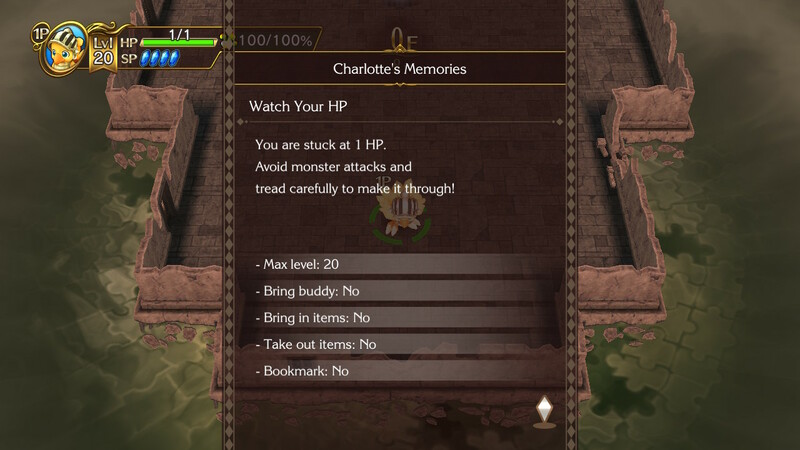 Dungeons can be tackled alone, or with buddy characters, which can be unlocked by collecting enough buddy points from fallen enemies of that type of enemy. For example, gather enough buddy points from Goblins, and you will unlock the ability to bring one into a dungeon as your buddy. Buddies provide assistance in attacking enemies, ensuring that Chocobo doesn’t always have to go at it alone. There are over 120 buddies to unlock, so you’re never going to be short of new characters to buddy up with. Dungeons are grid-based, meaning you move along the dungeon similarly to that of chess pieces. When Chocobo moves, so do the enemies, and making your way towards enemies often requires you to think smart to ensure that you can get in the first hit. Forcing enemies to approach you first grants you the ability to attack first, while hiding in a hallway is a tactic you can use when multiple enemies come at you at once, as only one can reach you. Little tactics like this add layers to the otherwise simple turn-based combat of exchanging blows until someone falls. Adding further lays to the combat is the job system. Chocobo has the ability to unlock and utilise multiple job classes that not only grant him cool costumes, but unique abilities and stats. For example, the Freelancer serves as your simplistic jack of all trades build, with no stat being at the expense of the other, whereas the knight class offers higher health and defence at the expense of magic and mind. There are fourteen classes to play as, so you’re sure to find a character type that suits your playstyle. Chocobo’s Mystery Dungeon Every Buddy! has core dungeons, as well as optional dungeons that often have unique spins on them, such as dungeons where you are given 1HP and must take a stealthy approach, to dungeons that don’t allow you to regenerate health while walking. All dungeons require you to clear numerous floors to reach the end, with most having some sort of boss battle at their conclusion. The game isn’t overly difficult, but deaths cause you to lose items. Normal mode will see you lose all items except the items you have equipped such as collars, talons and saddles, while hard mode sees you lose everything you have. These punishments may seem harsh and at times feel particularly mean, but this is normalcy in the mystery dungeon genre and it ultimately makes the game feel so much more rewarding when you make it through dungeons. It’s up to you as a player upon the staircase leading to the next floor to decide whether you want to cut your losses in order to leave with the loot you’ve acquired to then upgrade your items and come back stronger, or delve deeper in to the dungeon at the risk of losing everything. Despite the simplicity in combat, the game is insanely addicting, heavily in part due to its roguelike nature. This game somehow makes the process of grinding enjoyable, which is a big thing for me to say considering I am usually not a huge fan of excessive grinding. In terms of gripes, there isn’t much at all I disliked about Chocobo’s Mystery Dungeon Every Buddy!, however I did take notice of a few issues. Firstly, changing jobs never particularly felt like a necessity to me. I was quite fine playing as a knight for the majority of the game, and I only felt the need to break out of my comfort zone and play different classes such as the White Mage and the Black Mage for the sake of this review. The other jobs play fine don’t get me wrong, but I never really felt like I was required to change classes. I also feel like the buddy system feels a little bit tacked on. It wasn’t present in the original game, and it kind of shows. Effort was undoubtedly put in, and it achieves what it sets out to do, it just doesn’t seem necessary, and in turn it leads to the game feeling overly easy, particularly at the beginning. It may make the game more accessible, but I found myself making my way through numerous dungeons without using a buddy. Co-op doesn’t feel great either, as it ruins the fluid movement throughout dungeons that you get in the single player. Having to awkwardly meander through dungeons while a second player controls a buddy just isn’t fun, and the limited role that the second player has to play makes it feel kind of worthless. Chocobo’s Mystery Dungeon Every Buddy! is an extremely enjoyable gem that has given the underappreciated original release a chance to stand out again. The gameplay loop of dungeon crawling and knowing when to cut your losses is insanely addicting, and the interesting narrative ensures that the world of Lostime isn’t simply a throwaway. Having various character builds to tinker with is appreciated despite the fact it sometimes feels like it’s not required, and the buddy system allows you to turn foes into allies. 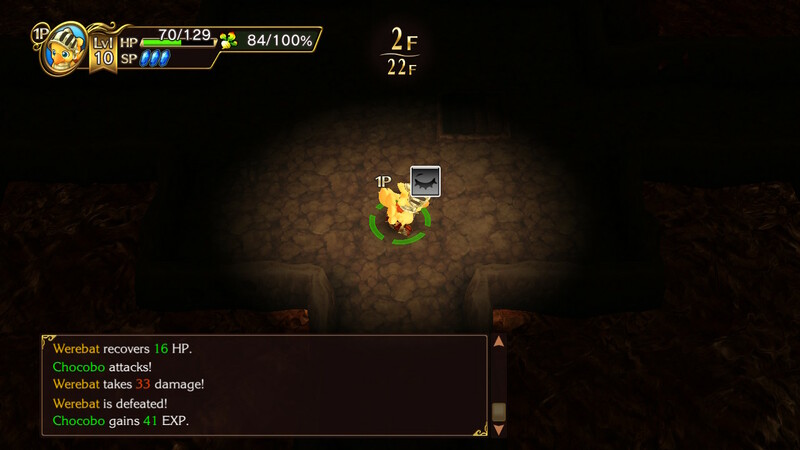 The roguelike nature may be a detractor for some, but in all honesty, Chocobo’s Mystery Dungeon Every Buddy! is arguably one of the most accessible game in the underappreciated Mystery Dungeon subgenre, and I recommend you give the game a crack, especially if you’re a diehard Final Fantasy fan.